Cleveland Area History: Cincinnati in the 1820s - Identifying the Location Depicted in "Ohio River Landscape"
Cincinnati in the 1820s - Identifying the Location Depicted in "Ohio River Landscape"
Ohio River Landscape / The Steamboat Washington, an oil painting, circa 1820. Used courtesy of Mr. and Mrs. Samuel Schwartz, Paterson, NJ (as of 1987). Reproduced from Folk Painters of America (1979) by Robert Bishop. When I came across this painting in Robert Bishop's Folk Painters of America, I decided to add it to my ongoing research collection, Ohio Art through 1865, even though it felt more like something that one might find in the American south, because the odds were better than even that, at least in theory, it depicted an Ohio scene. However, when I added it to the set, I assumed, eyeballing, it, that perhaps 60% of the Ohio River was in Ohio - so a site described as Ohio River Landscape had better than even odds of being in Ohio - at least in a situation like this where both sides of the river are included. I've been collecting all the images that I can find illustrating Ohio and created before 1866, without regard to quality - a low quality image can at least act as a placeholder. 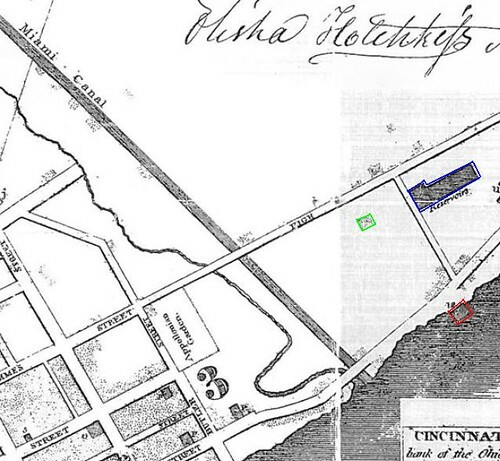 Topographical Map of the City of Cincinnati, from Actual Survey by Capt. H. L. Barnum A print (1831), engraved and published by Doolittle & Munson. Used courtesy of the Cincinnati Historical Society Library. Digitized as part of Art as Image; Prints and Promotion in Cincinnati, Ohio, Alice M. Cornell, editor. A couple days ago, a colleague mentioned an 1831 map of Cincinnati in his possession. I searched my image collection and came up with the map you see above. When I saw the images in the border with fresh eyes, I immediately recognized the composition - look on the top border, second image from the left. One can see, even in the tiny image, the large building, right at the water's edge. The slope of the hill is similar, and there's the building with two small wings halfway up the hillside. A higher resolution version of this map would surely verify that this painting depicted the same scene illustrated in the scene. Unfortunately, I could not locate one online. Water works; Cincinnati; Mouth of Licking River; Sycamore Street Church; Second Presbyterian Church; Commercial Bank; Unitarian church; Christ's Church; U.S. Branch Bank; Roman Catholic church; Methodist church; Baptist church; Medical college. 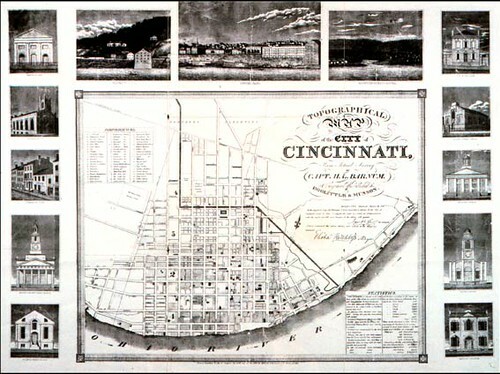 Cincinnati, (March, 1834) by Doolittle & Munson. Used courtesy of the Cincinnati Museum Center. Reproduced from Bulletin of the Historical and Philosophical Society of Ohio, June, 1945. After working by process of elimination for a bit, I came to the conclusion that the first three subjects were probably the three center images. I'd seen the composition at center before - a view of Cincinnati shown here. The image immediately to the right of it looked to, plausibly, be the mouth of a river, which would make the one to the left - the subject of our painting - the Water Works. I was able to find, on Sandman Cincinnati, several maps that help illustrate the location depicted here. Detail, Topographical Map of the City of Cincinnati, from Actual Survey by Capt. H. L. Barnum A print (1831), engraved and published by Doolittle & Munson. Used courtesy of Sandman Cincinnati. On this map, the water works is outlined in red, a house in green, and reservoirs, in blue. The Miami and Erie Canal empties into the Ohio River here, near the mouth of Deer Creek. The map provides some hint that we may be on the right track, but it's hardly conclusive. For comparison, this map illustrates the same approximate area in Cincinnati today. Detail, City of Cincinnati From Actual Survey by Joseph Gest (1838). Used courtesy of Sandman Cincinnati. 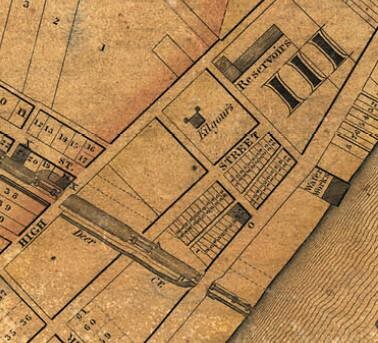 This detail of an 1838 map shows the same area. Near the center is a square, flanked by two smaller squares, labeled "Kilgour's". This rather distinctive footprint is identical to that of the house illustrated in the painting. To better illustrate what I think we're seeing here, let's take another look at the painting itself. In the foreground, we see the Ohio River and its north shore, as viewed from Kentucky. A steamboat, "Washington", is visible on the river. On the right, there's a brick building with a stone foundation - the water works. A channel runs up the hillside from the water works to what appears, from this angle, to be a triangle-shaped reservoir. A grand house, owned by one "Kilgour", sits in the center. It is surrounded by a large, well manicured yard and garden. At the left, part of a bridge, over Deer Creek, is visible. The hillside appears green, and there are still quite a few trees on it. 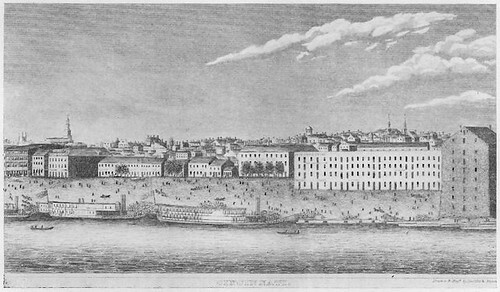 Cincinnati Panorama, A daguerreotype (1848) by Charles Fontayne and William S. Porter. Used courtesy of the Public Library of Cincinnati and Hamilton County. This massive daguerreotype, by Fontayne and Porter, was made 20-30 years after the painting. It illustrates how much the area had changed in the intervening years. It's worth taking the time to look at in detail - the image represents the largest-scale early photograph of a city. Take a few minutes to stop and look at the extra large version - it's amazing. 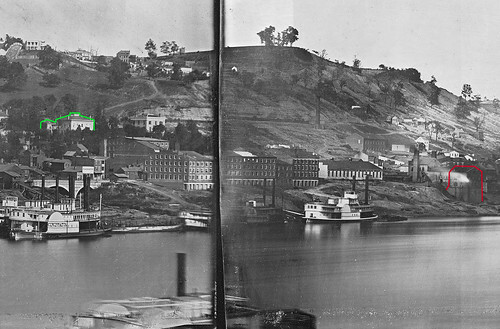 Detail, Cincinnati Panorama, A daguerreotype (1848) by Charles Fontayne and William S. Porter. 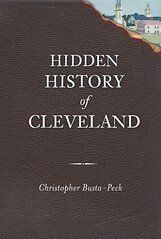 Used courtesy of the Public Library of Cincinnati and Hamilton County. The area illustrated in our painting is covered in the right half of plate 6 and the left half of plate 7 of the daguerreotype. Note that the Fontayne and Porter, the photographers, were at a point considerably downstream (left) of the site used by the painter. Here's the same image, with the Charles H. Kilgour house outlined in green and the water works outlined in red, for greater visibility. Note that on the water works building, an addition had been made to the rear, and the roofline changed, but the distinctive structure remains the same. Likewise, an entire story had been added to the Kilgour house. Immediately below the Kilgour house, one can see the stone bridge that was built over Deer Creek, replacing the one seen in the painting. Note, too, how much the city had been built up in the couple decades since the painting had been made. Front (South) Elevation, Marine Hospital, Third & Kilgour Streets, Cincinnati, Hamilton County, OH. A drawing (April 2, 1934) by C. Brodersen for the Historic American Buildings Survey. Used courtesy of the Library of Congress. In the 1930s, the Charles H. Kilgour house was documented in detail by the Historic American Buildings Survey, a WPA project to record our country's most historically signfincant structures. I stumbled across these images by chance - they were labeled as the "Marine Hospital" - they only came up in my searches because they happened to include a description noting that the structure had been located at the intersection of Kilgour and Third. Although the structure was altered considerably over time - perhaps most notably with the addition of a second floor, these drawings, compared with the painting and the 1848 daguerreotype, can help us see how it was changed. Note the Palladian window on the first floor, at the far right. One was present on at the far left as well. Detail, South Doorway. - Marine Hospital, Third & Kilgour Streets, Cincinnati, Hamilton County, OH. 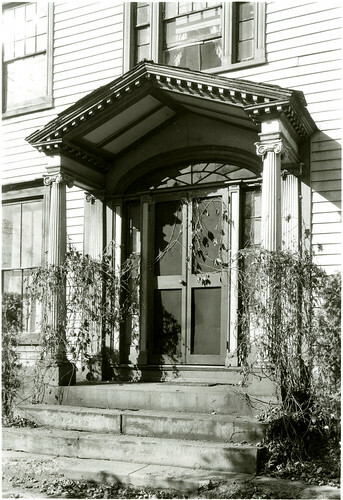 A photograph (March 5, 1934) by Edgar D. Tyler for the Historic American Buildings Survey. Used courtesy of the Library of Congress. 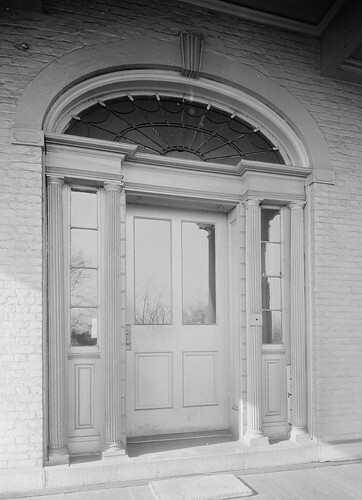 The grand front doorway was still present in the 1930s, though the porch had been changed to something larger long before. Kinsman House, Kinsman, Ohio, a photograph by I.T. Frary. Used courtesy of the Ohio Historical Society. The front porch appears to have originally resembled the one present on the Kinsman House, in Kinsman, Ohio. Detail, Main Hall Looking North. 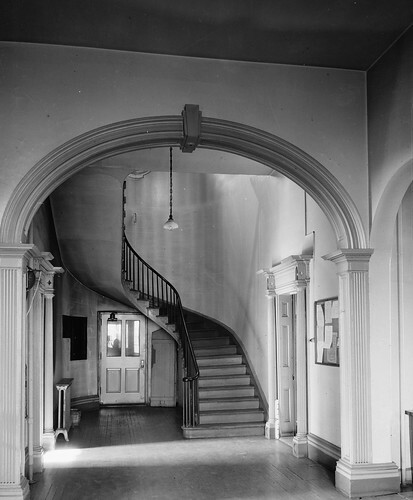 - Marine Hospital, Third & Kilgour Streets, Cincinnati, Hamilton County, OH, a photograph (March 5, 1934) by Edgar D. Tyler for the Historic American Buildings Survey. Used courtesy of the Library of Congress. On entering the house, one would be greeted by this grand hall. It appears that most of the first first floor wasn't altered by the several rounds of renovations. 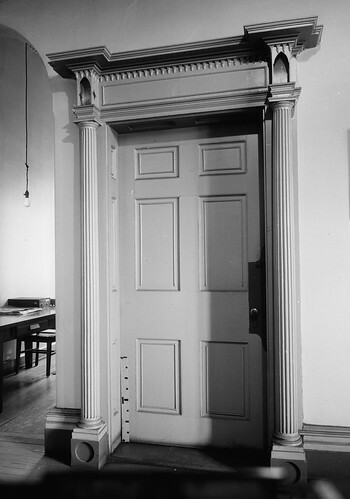 Detail, Doorway from Hallway, First Floor, Marine Hospital, Third & Kilgour Streets, Cincinnati, Hamilton County, OH, a photograph (March 5, 1934) by Edgar D. Tyler for the Historic American Buildings Survey. Used courtesy of the Library of Congress. The interior woodwork ranks among the very best I've ever seen in an Ohio house from this period. In fact, I can't recall ever having seen an interior doorway like this - woodwork of this style is virtually always reserved for exteriors. 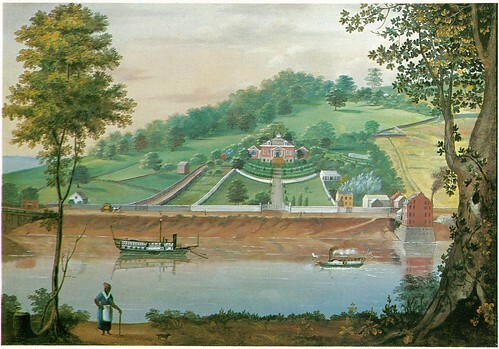 This painting does much to illustrate how Cincinnati changed between 1820 and 1850. It shows how a landscape went from being agricultural to commercial / industrial - and it illustrates it in a way that text never could. For now, the big mystery is locating the painting itself. I'm sure that with a higher resolution image, even more could be learned. Thanks for writing this up - very interesting! I have some more info for you; will try to summarize it tonight. I totally LOVE your detective work on this. It was extremely interesting to read about it and view the other images! Well, this is fairly spectacular research. Well done.